Musical Instruments and Accessories available from The Music Box Shop, Bristol. CAL63 Electric Guitars by Chord, available in a variety of different colours. Here is the Chord CAL63 Electric guitar. 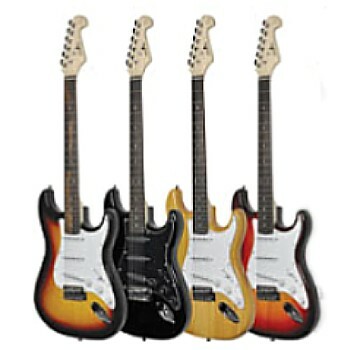 It is a traditionally styled standard electric guitar, available from us in a variety of different colours, as shown within the image: 3 tone-sunburst with a white scratchplate, black with a black scratchplate, amber with a white scratchplate or cherry burst with a white scratchplate. The guitar has three single coil pickups, a contoured alder body and a maple neck. It is fitted with 22 frets into the rosewood fingerboard. The bridge comes with a vintage styled vibrato system. It is an extremely versatile and affordable guitar, consisting of two tones and a master volume with a 5-way lever selector. All instruments are checked and serviced by our in house guitar technicians before dispatch. Please Note: All guitars are supplied with a gig bag.